Not long after I got on Ravelry I indulged my curiosity and signed up for a swap. It went well so I signed up for another. Then my Wednesday night ice cream and knitting enablers asked if I wanted to participate in a third. Oh my the third time was indeed a charm. The Swap on a Budget group is a FUN bunch of Ravelers. Our mission was to spoil our parters as much as $20 would allow. 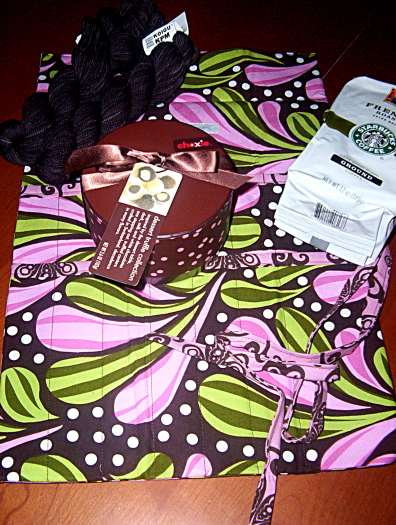 Can you imagine how amazed I was to receive this package from Knitastic Susie last week? This woman knows how to shop people. I think we ought to let Washington know how far she can stretch $20, maybe she could help balance our budget. Now if you will excuse me, I have some knitting to do. So, what do you do when you are feeling a little overwhelmed? I tend toward frantic thoughts and procrastination, but I also have a compulsion to always be “doing something”. Luckily my husband and my mother in law are both really calm, steady people. They have taught me a lot. So I *try* to just start slow, get organized and force myself to be content with slow progress. You know what, it works really well. Another thing that helps is having laptop go down… or maybe (oh dear) unplug it, and force yourself to do things away from the keyboard! Yes, that is good for the house and the soul… but now I feel backlogged with things to share. Don’t worry I’ll be back soon with pictures. In the meantime, allow yourself the time you need to do the things you have to get done. I hope you are able to savor the sweetness as you do. MY SHOP is offically OPEN FOR BUSINESS! Wow, that was A. LOT. OF. WORK. To celebrate, I think a nice cup of coffee is in order. Perhaps tea, if you prefer. Either way we want to keep our drinks warm and our fingers cool. A cup cozy would be the perfect thing, don’t you think? Well I happen to have one right here. You can probably knit it before your barista has finished making your drink. You are currently browsing the Bunny Slippers blog archives for May, 2008.